Fourth Battle of Beleriand (455 Y.S.) - Also known as Dagor Bragollach (The Battle of Sudden Flame). After Dagor Aglareb, the Elves laid siege to Angband to prevent another attack. It lasted four-hundred years. Morgoth finally broke the siege with Dagor Bragollach. 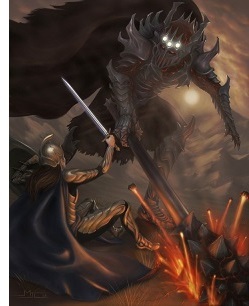 Fingolfin was killed by Morgoth when he challenged him to single-combat.